Gladiator is probably Intramurals’ most wacky annual event, chock-full of out of the ordinary activities meant to challenge your body and mind while making you laugh. Remember what it was like to be a kid, jumping on bouncy castles and playing with those huge rainbow tarps? 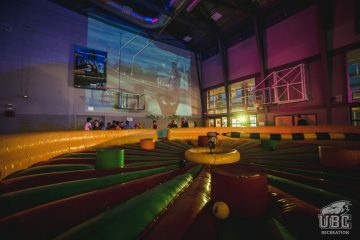 Imagine that much fun, but for adults and featuring a competitive twist. Need I say more? 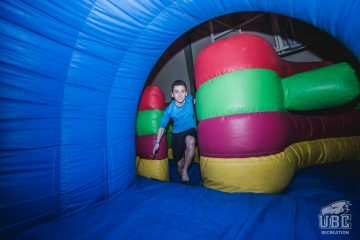 What could be more fun than racing through bouncy mazes, seeing your friends get knocked down by the Whip It or trying a BRAND NEW inflatable obstacle course that Gladiator has never seen! If you have ever wanted to Howl with Hodor, sing with a Stark, or twirl with a Targaryen (as you can tell, I don’t watch Game of Thrones) – then you won’t want to miss this event! Not to mention more games, more puzzles, teamwork and those coveted champ shirts! A Team of 6-10 competitors. Each team must have 6-10 people, with the Co-Rec ratio of less than 50% self-identified men. Comfortable footwear and clothes you can move in! Don’t forget to break out your Game of Thrones wear while you’re at it- armour? Check! Crowns? Check! Full (faux) furs? Check! If it fits Game of Thrones, bring it out- it might help you snag some team spirit points! To check out our Facebook Event! You’ll find all the updates you’ll need to stay on top of this event. Helpful tips, game reveals and reminders will all help you keep your edge over other teams in the competition! This event is one of lowest barrier events that you will be able to find. You don’t need any specialized knowledge on how this event works, you honestly just need to know how to bounce. Plus, the wild and fun premise of this event means that even if you wipe out, it won’t even be that embarrassing. To head off campus- Gladiator is held in the SRC! 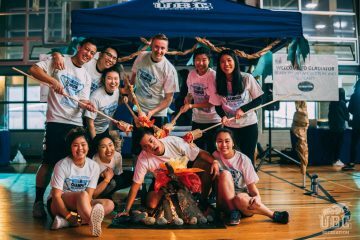 Gladiator takes place at the Student Recreation Centre, making this is the perfect event for students living in residence as well as those who commute alike. Live in Totem Park? It’s just a 10-minute walk from the event. Live off campus? It’s right beside the bus loop! Win-win! Don’t miss out- Register your team by JANUARY 14 for a night of inflatables, puzzles and teamwork!